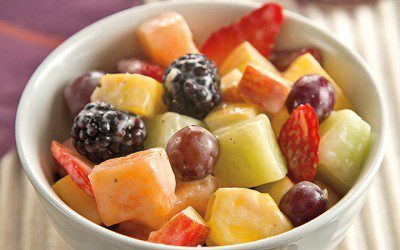 Combine pineapple, cantaloupe, honeydew, blackberries, strawberries, grapes, and apple in large bowl; gently mix. Combine bananas, yogurt, honey, lemon juice, and nutmeg in blender or food processor; blend until smooth. Pour dressing over fruit mixture; gently toss to coat evenly. Serve immediately. Exchanges per serving: 2 Fruit.